pads to one of the teachers at Matombo Secondary School. MASVINGO – MSU, Media and Society Studies students who were recently on a rural reporting trip have launched on girlchild awareness campaign in the populous district of Gutu. 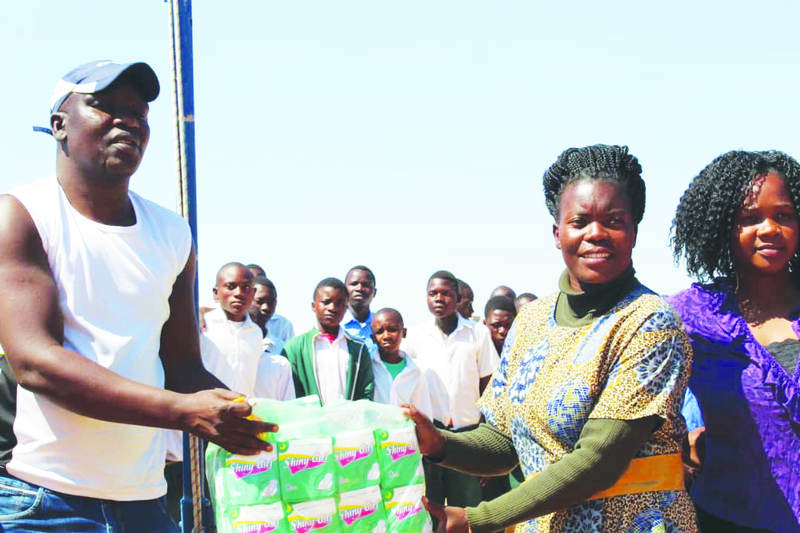 The students who were led by Doctor Nyasha Mapuwei and Caven Masuku donated sanitary pads, bathing and washing soap, books, pens, food stuffs worth $500 to pupils at Matombo Primary and Secondary Schools. 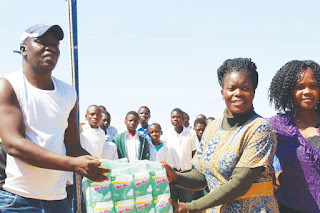 Teachers at Matombo Secondary thanked Doctor Mapuwei and his team for donating sanitary pads as some girls were using leaves and tissues during their menstruation because of the harsh economic conditions. “We always donate when we go on rural reporting trips, we are giving back to the community and urging others to contribute towards the upkeep of the school going children,” said Dr Mapuwei. The resources were raised by the students and lecturers through appeals to well-wishers.